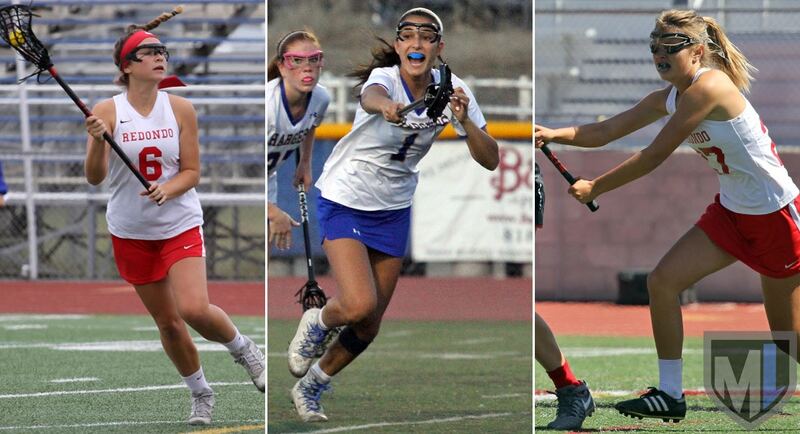 Our look at girls lacrosse players to watch in the 2018 season moves to the junior class and includes three midfielders who went head to head in the US Lacrosse LA semifinals last year, playing key roles for title contenders as sophomores. From left, above: Addison Bass, Redondo Union; Piper Spindle, Agoura; Emma Hodges, Redondo Union. A midfielder, Bass led the North champions in goals as a sophomore with 53 and was third on the team in points with 68. She also collected 45 ground balls and earned first-team All-Bay League and first-team All-North Division. In her second varsity season as a sophomore last year, Spindle ranked among Agoura’s leaders in points (48), goals (39), draw controls (46) and ground balls (26). She was named first-team All-Marmonte League and second-team all-North Division. Another Sea Hawks midfielder, Hodges was second on the team last year in points (71), goals (47) and assists (24), teaming with Bass to form a dynamic 1-2 punch. Hodges was named first team All-Bay League and first team All-North Division. She had four goals and three assists in the LA championship game vs. Chaminade. Zella Bedoian, Birmingham: Scored 39 goals and had 22 assists as a sophomore. Lexi Carson, M/D, Chaminade: A defender as a sophomore, Coach Scott Cohen says Carson will be all over the field as a junior. Kelly Hoyt, midfielder, Palos Verdes: The 2017 Bay League most outstanding player and Palos Verdes MVP. Jessica Ricketts, attack, Thousand Oaks: Had 39 goals and 30 assists as a sophomore, earning first-team All-Marmonte League and honorable mention All-North Division. Not many coaches submitted names of juniors to watch this year, so let us know who we missed using the comments below.